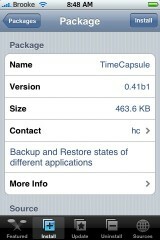 Many of you probably remember TimeCapsule, an application that allows you to back up your iPhone, from firmware 1.1.4 and below. Well, it is now available for firmware 2.0+ however it has a new name. 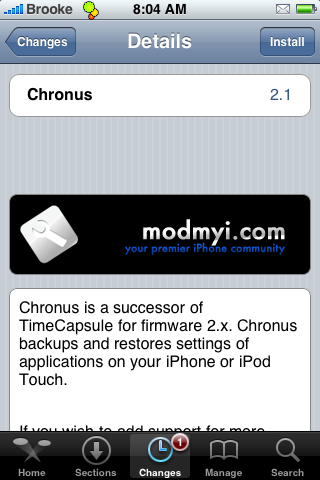 It is now called Chronus. The icon is the same and the application itself looks and functions much the same as before. 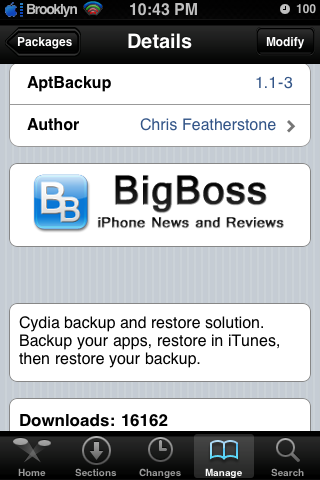 You are able to back-up Stock, Cydia and App Store applications (Documents folder). The application list is a little limited at the moment and the ability to backup your Contacts is missing. But, the developer is working on both of these things and we should see some good updates in the future. The app reminds me a lot of the first releases of TimeCapsule but I know we will see more features soon. 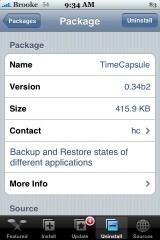 In version 0.43b1 of TimeCapsule, a back-up and restore application, the developer has rewritten the backup function of the application…making it more stable. You can get TimeCapsule via the databinge source. 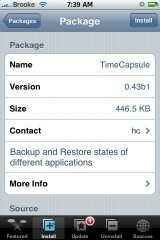 The update to version 0.42b1 of TimeCapsule adds a few new features. Below is the change log via the developer. I would give you specifics but, my iPhone died! So, it is restore time again. I swear these restores are getting closer and closer together! TimeCapsule is available via the databinge source. There are no visual changes to version 0.41b1 of TimeCapsule. However, it does add the Danish translation back into the app and tidied up some code (Removed ‘backup by csv’ for everything other than SMS, because it was not supposed to be there). TimeCapsule is avilable through the databinge source. 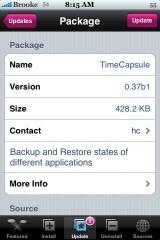 • The backup location has changed from ~/Library/TimeCapsule to ~/Library/Preferences/TimeCapsule. The update to version 0.37b1 of TimeCapsule now allows you to back-up your mobile favorites. Which is cool. You can also email SMS Repository in tab-delimited file (can be opened with EXCEL) and localization with lproj. I cannot tell you much about the last two options. They are restricted to the full version which unfortunately I do not have. Though, I did grab some screenshots off the developer’s website. TimeCapsule is available through the databinge source. A quick update to version 0.34b2 of TimeCapsule fixes the issue from the previous version in which you were not able to back-up VNotes. After updating, VNotes was in the list on applications that could be backed-up and I was able to create a back-up of it. TimeCapsule is available through the databinge source.